Visiting Vietnam was a disquieting experience on many levels. It has been part of my emotional vocabulary since my college years; the center of so many arguments and social issues. I knew what we should be doing there and what we should not as there were always others who had deep emotional commitments to the opposite viewpoint. But until I went there, those ideas were just that: concepts not at all rooted in experience. Those ideas were something to think about, but not something with concrete reality. 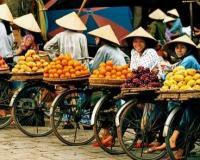 I have wanted to visit Vietnam since it was “opened” for tourist travel. On some level I wanted to see what it was since I had thought about it for so long. I knew we saw the northern country as a threat to something that led us to many years of military intervention. Arriving in Hanoi I felt slightly guilty about being there—this was the capital of a country that had supposedly threatened us to war. What did I see? I was deeply impressed as I saw pictures of the life and times of Ho Chi Minh, who looked and sounded more like Gandhi than the communist ogre he was portrayed as. His commitment was to values about people, personal humanism, and to the liberation of his people from a succession in influences—China, France and the U.S. It was hard to see him as evil. There was a huge memorial to him not unlike that we have for some of our noted presidents. I saw a country that was in the shadow of China and the center of an ancient civilization two millennia old! They deeply wanted to be free and regain some of the stature they had in the early years of the common era, when the Khmer empire unified the whole of southeast Asia, trading and building templed like those of Angkor Wat. From the 19th century, Vietnam became a colony of France, fighting and finally winning their independence in 1954 only to find their country divided into North and South by the United Nations, leading them to have to fight another war to become unified, finally. Since then, that same regime had evolved into a peaceful but highly centralized government that supports economic freedom and the well-being of all its citizens. A wonderful story, except that it is diametrically different than the narrative about which we argued for so many years. It was easy for us to have opinions about them even though we had almost no clear information about them. We now know that our leaders as well pursued their paths to war with very little idea of what the reality was of the country and its culture. What were we doing there? I kept wondering about this as I visited cities and saw villages with vital agrarian economies that had learned to prosper in a land that was flooded for about 10 weeks each year. I thought about the specter of communism, still the governing model, that looked in practice no different from any other quickly developing country. The communism of China and Vietnam is no longer the threat that we now see in theocracies, like Iran. I visited museums of the war and went into the tunnels where the VietCong had hidden below the U.S. army bases, and wondered what we were doing when we went to war with them? Seeing the country, I had no idea what we could have meant by winning the war. I couldn’t even imagine how we could distinguish who was for or against the U.S., which indeed was the problem when we were there fighting. While you could see people without limbs from time to time, it was hard to find any other visible signs of the war, which I know from accounts was horrible. As I went up the Mekong River by boat, where now more than two million people live, I remembered the trip portrayed in the movie Apocalypse Now. We are now at war with other countries who remain concepts to us, not real people, and my visit served me up with some challenging insights. First, while in Vietnam I read how some pundits are calling for us to attack Iran. I could see how easy it is to have opinions of a far-off place because there is no way that we can really understand what we would actually be doing in that place. Who really knows what is happening to people in Iraq and Afghanistan as we intervene there? How would we know we had “won” if people can change their minds when we are gone? I wonder if the fact that, because we have not a war on our shores since the Civil War, it is so easy for us to ask for and even conduct a war overseas. We can argue for geopolitical goals and outcomes that bear no relation to reality with emotional opinions about what we should do as loud as our experience is lacking. The media join the debates, listen to statements by candidates, and talk about foreign interventions as if they are video games. As Paul Krugman points out, the war in Iraq has cost us a trillion dollars and more to come, and we never really consider what other uses this money and effort could have been used for. I have a deeper respect for the different perspectives of southeast Asia after spending several weeks there—the first time I have seen and experienced what the country is doing. Seeing people and experiencing the reality leads me to think about the war and ask questions that I did not ask at the time and that I could not have answered anyway. I think as students and representatives of the academy, one thing we can stand for is to make sure that our thinking is not simply conceptual, but is grounded in some way in direct understanding of what we are thinking about.